Chas. Addams rose to fame, was also the birthplace of one of the most familiar and well-loved pantomime comic strips in American history — The Little King, by O. (for Otto) Soglow. Near-pantomime, we should say. Like Henry, another magazine cartoon star who made it into newspaper comics, the title character of The Little King (whatever his name may have been) doesn't speak, but sometimes allows his supporting characters to utter a couple of words to set up the mostly-pantomime gag. And this sparsity of language isn't the only element of the minimalist approach Soglow took toward his cartooning. There is also a sparsity of linework to rival that of Barnaby, another favorite among comic strip critics. Soglow believed in putting as little as possible between the reader and the humor. Soglow derived this humor from the character himself, a rich and well-rounded one, a fact made all the more remarkable by the unavailablity of dialog for character development. The Little King (who qualified for his adjective only vertically — he was quite large in the waist) was monarch of all he surveyed, but took a down-to-earth attitude toward the fact. He made his own trips to the palace mailbox, sat behind his throne to eat lunch from a workman's pail, and even did occasional household chores. He was undignified enough to slide down banisters, and took obvious delight in the fact that nobody could tell him not to. Ambassadors, courtiers and even palace servants were often vexed by his lackadaisical practice of the kinging trade, but what could they do? Soglow (a professional cartoonist since 1919) was already a frequent New Yorker contributor when, in 1931, some of his cartoons for that venue began featuring his diminutive monarch. It wasn't long before they came to the favorable attention of William Randolph Hearst, who, characteristically, wanted the character for his King Features Syndicate. Contractual obligations forbade Soglow to transfer his creation right away, so Hearst had to settle for a clone titled The Ambassador. Soglow's contract with The New Yorker expired in 1934. The Little King began as a King Features Sunday page on September 9 of that year, and The Ambassador disappeared forever. By that time, The Little King was already appearing in book form. Collections of Soglow's cartoons began appearing in 1933, and continued for years. Needing little or no translation, naturally, they were popular the world over. That same year, The Van Beuren Studio, which also licensed such stars as Amos & Andy and Toonerville Folks, made The Fatal Note, first of their ten animated cartoons, released during 1933-34, with him as the star. He was licensed for animation again in 1937, when Max Fleischer's studio co-starred him with Betty Boop. The Little King also got into comic books, tho not in a very big way. King Comics, where Popeye was the main star, not only began reprinting his pages with its first issue (April, 1936) — it also made his image a part of the logo, as if he, and not King Features, were the king it was named after. In the 1950s, Dell Comics devoted three issues of its Four Color Comics series to new stories about him, by Soglow. And there was the usual merchandising. Possibly the cleverest commercial use of the character was a little china bell, shaped precisely like the king himself, whose handle was his head. 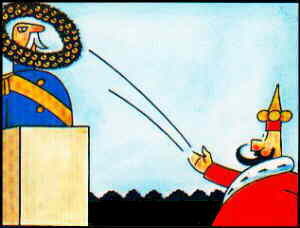 The Little King wasn't one of comics' greatest mega-hits, but it provided chuckles to a sizable audience for decades, and was so highly regarded by Soglow's peers in the cartooning community that in 1966, it won him a Reuben Award. However, the ability to handle such an appealing character in so few lines, using practically no words at all, is a rare one. When Soglow died, in 1975, the series ended. Text ©2002-06 Donald D. Markstein. Art © King Features Syndicate.